5-Meat Giant Pizza is a combination of go, grow ang glow foods and what better way to encourage your child to go on achieving that with this gigantic one-for-all grub? Popular singer Rachel Ann Go gives her two-thumbs-up sign for the yummy combo of pepperoni, sausage, ham, ground meat and bacon in this colossal treat. 1. To make the sauce, heat the oil in a pan and then add the onion and garlic. Fry gently for about 6-7 minutes, until softened. Add the tomatoes and stir in the tomato paste. Bring to a boil and boil rapidly for 5 minutes, until reduced slightly. Remove the pan from the heat and leave to cool. 2. For the pizza base, lightly grease a 12-in. (?) round pizza tray. Sift the flour and salt into a bowl. Sprinkle over the fast-rising yeast and make a well in the center. Pour in about ¾ cup warm water and the olive oil, and then mix to a soft dough. 3. Place the dough on a lightly floured surface and knead for about 5-10 minutes, until smooth. Roll out to a 10in round, making the edges slightly thicker than the center. Lift the dough on to the pizza tray. 4. Spread the tomato sauce over the dough and then top with the peppers. 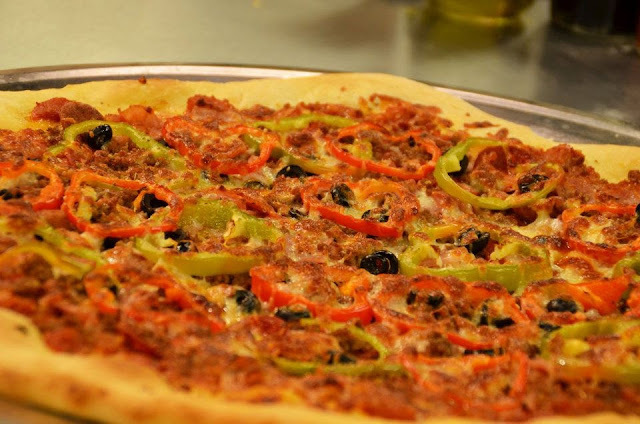 Mozzarella, pepperoni sausage, ham, ground meat, bacon, sausage, black olives and tomatoes. Sprinkle over the oregano and drizzle with olive oil. Cover loosely and leave in a warm place for 30 minutes, until slightly risen. In the meantime, preheat the oven to 425°F. 5. Bake for 25-30 minutes and serve hot straight from the tray.